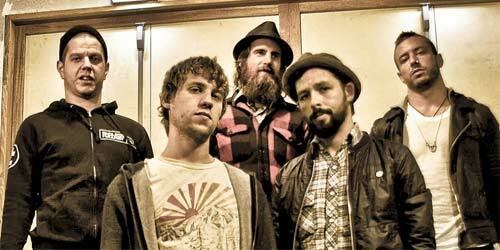 The Dillinger Escape Plan are returning to Australia, this time for Soundwave Festival in 2012. If you have seen them perform live before, then you will know what you are in for. If you haven’t, then make it a priority and prepare yourself for power, intensity and a trail of destruction. With their last album Option Paralysis now over 18 months old, the band have just kicked off the writing sessions for the follow up. Only hours away from heading into a writing session, we chatted with guitarist Ben Weinman about, amongst other things, Soundwave 2012 and an update on his Guitar Tongue Orchestra project and his other with Mike Patton. Hey Ben, thanks for taking the time to chat! So where in the world do we find you today…you have not long finished up touring with Mastodon right, how did that go? Yes, I’m home in New Jersey right now. The tour was very good, we’ve been friends with those guys for years and even some of those guys before they were in Mastodon, and so to be able to go out on the road again and team up is really great. So in general, how has 2011 as far as touring is concerned? It’s been unbelievable, I don’t think we’ve ever had this many opportunities in our whole career as we have this year to get in front of so many of our fans and in front of new people. So it’s been a very productive year in that way for sure! You got to head over to the UK and play some shows as well I see? Yes we definitely did, we pretty much covered the whole world except for Australia, which we are obviously getting excited about coming back for. We did Europe, the UK, we just did a US tour, but we actually did two US tours this year, one with the Deftones and then just with Mastodon. So is there somewhere that haven’t you played yet, which is pretty high on the agenda of regions you want to crack? We haven’t really played in Asia, other than Japan so we’d like to hit some more markets over there and we’re actually working on that for after Soundwave. Also South America, such as Brazil, we need to knock that off our list as well. 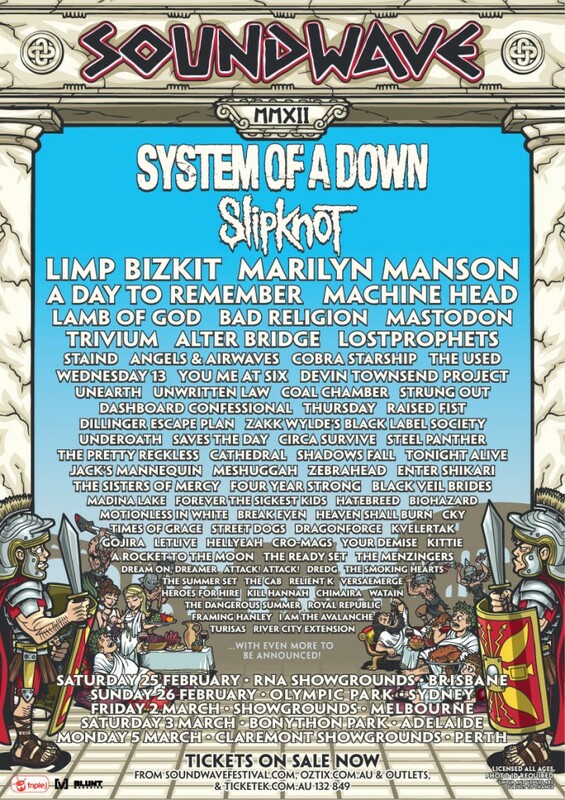 So between now and early next year when you head back to Australia for Soundwave 2012, is it a time for a well earned break? Well we are heading back again to the UK again actually for some more shows with Mastodon. But we are also getting ready and about to start diving into writing the new Dillinger album and we will continue doing that up until Soundwave and after as well. You mentioned writing the new album, has that actually started yet? Well we’ve been messing around with a few ideas in the tour bus, but it’s really starting tonight when we will dive into it and get some new ideas going. Having played Soundwave Festival before, what do you have to say about how it ranks as a festival compared to others that you have played? Its amazing, Australia on general has got to be out favourite place in the world to play and I’ve said it before and I’ll say it again, we’ve yet to find a place that’s more enjoyable to tour than Australia and obviously last time we played Soundwave it was amazing. It was our first to really playing in front of a lot of new fans in Australia. We’d been coming before and playing our own shows but Soundwave was great to play to a bunch of new people and see some of our favourite bands play such as Alice In Chains and Nine Inch Nails and we are looking forward to getting back for it again. Have there yet been any discussions of sideshows? You know, we probably will, but I haven’t heard anything concrete as yet about who, when and where, but I’m sure there will be, I just don’t know the details just yet. 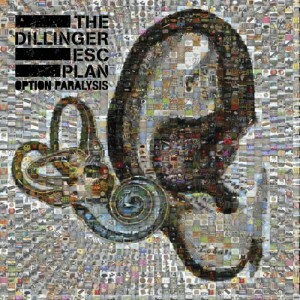 Having toured your most recent album Option Paralysis which you released in what, March 2010…what are your thoughts on that album now when you reflect on it now? Yeah it’s hard to believe It’s been that long, we’ve hit the road and haven’t looked back since. The songs are still fresh to us and there are songs we haven’t yet played live that we really want to. We tour so much that it’s hard to often stop and take inventory on it all. In general we are excited to be working on new music but I’m still excited by Option Paralysis you know. Looking back on the process of writing and recording Option Paralysis, have you got any key things in your head at the moment that you are looking to change up for the next album? That is a gooood question. You know, we never really go into writing a new record with any big picture, we definitely start making songs that we want and that we are interested in. After it’s all done, then it’s real easy to look at the body of work and say it’s pretty obvious where we’ve been as a band and personally has had an effect on the way that this record sounds. We can definitely hear it on our past records and I know it when I listen back to it that it’s obvious what was going through our heads and happening in our lives and the effect it had on the record. But we never dive into it with a big picture saying we want the album to sound like “this”, it’s about recording something that we enjoy and feel good about it. I guess one of the fundamental things this time around was the way you released the album on your own label Party Smasher…how was that whole experience? We did it in collaboration with the French label Seasons of Mist and has our own moniker on it, the Party Smasher imprint and it’s really our first step in trying things differently. We’d come out of a long contract and given the state of the industry we wanted to be in a position where we could move forward with as many options as possible to maintain a certain level of creative control and options considering the state of the business and that was definitely the best way we could continue to be productive and not tie ourselves down to anything we might regret in the future. So we’re pretty excited and it’s a pretty open ended situation for us business wise and we like to keep it that way! Our singer Greg has been working on a project with Max Cavalera and I’m not sure where that’s at exactly. I think Max has been really busy with a new Soulfly record, but I think they are definitely going to finish that and continue on with it at some point. I’ve been working on the GTO (Giraffe Tongue Orchestra) project with Brent Hinds from Mastodon, Eric Avery from Janes Addiction and we’ve just taken on board actually Jon Theodore from The Mars Volta and there will be a number of other guests on it and we have been talking some pretty interesting singers as well. That’s pretty exciting and we are well into a lot of music for it and it’s one of those things that started out as just an idea and when everyone got excited about it and heard people talking about it we thought we should take it a bit more seriously. It seems to really be working and I’m excited about it! Is that looking at a 2012 release or a wait and see? It’s one of those things where we’re all busy but at the same time we’ve ball been really excited about putting time into it and making it work as well. Even myself and Brett being on tour together just recently gave us a chance to work on some stuff. There’s definitely been a good deal of productivity and I think that’s realistic to say. Now there also been discussion of yourself collaborating with Mike Patton on another project, is there any update on where that is at? That’s definitely in the early stages. It’s something we’ve talked about for many years and we have always said it has to happen and we’ve always said we have to get together and work again. While we agreed it wouldn’t make sense to do it from a Dillinger stand point as Greg’s our singer now and we’ve been working together for many years, Mike and I realized after we did the collaboration it definitely made sense to keep doing things creatively. It’s in its early stages, but there’s actual music files being sent back and forth. But that’s really going to be based upon time and what we’ve both got going on, so I really can’t talk much more about how much time and how long it’s going to all take, or what exactly it’s going to be. But I can say that people who were a fan of our work before, are going to be pretty happy! And given we have a bit of time to cover it, just lastly…as far as guitar stuff goes, any endorsements or latest products you have been involved in that you want to mention? I can say that I recently got one of these mini rectifier heads, that are 25 watts made by Mesa Boogie and it’s pretty exciting. I was actually just doing some demoing and stuff like that with and I can’t say enough cool things about it. It sounds amazing and it’s small enough to fit in a little bag and carry on a plane or bring along to practice. It’s crushing, it’s amazing, it’s all 2 head and I love it! So that’s definitely one thing I want to push!! So after you finish up with the Australia visit…what’s the plan for 2012 at this stage? Yes absolutely, we will be doing a bit more touring as you know, but we will be writing the new Dillinger and tonight is the first night we are really kicking that off, so that’s going to be pretty exciting!